Australia is the kind of friend that takes your side even when you’re wrong. In geopolitical terms, this means that when the United States asked for some help with our quagmire in Afghanistan, Australia sacrificed 42 of its young people to our cause. So, when Australian prime minister Malcolm Turnbull reminded President Trump of America’s commitment to take in 1,250 of the refugees that the Aussie government had been keeping in (inhumane) detention centers, he had little reason to believe that he’d be met with a torrent of verbal abuse. In the coming weeks, that stupid, horrible, disgusting deal will finally go into effect — and provide the first 25 (heavily vetted) refugees from the islands of Nauru and Papua New Guinea with a chance to start a new life in the United States. 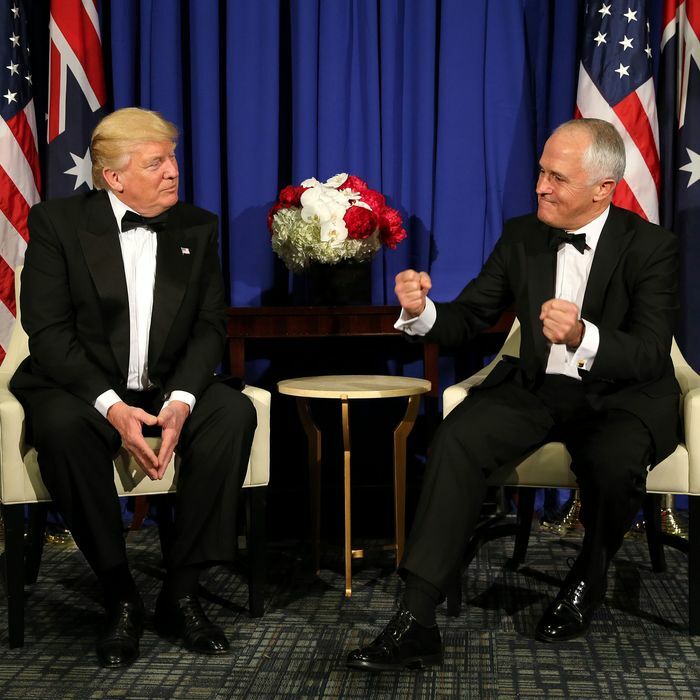 “I just want to thank again, President Trump for continuing with that arrangement,” Turnbull told the Australian media Wednesday. Under the terms of that arrangement, the U.S. is free to reject any refugees who fail to meet their vetting standards. Thus far, the Trump administration already identified roughly 50 refugees that it is comfortable taking in. In exchange for this hospitality, Australia will resettle some of the Central American migrants who are being held in U.S.-run detention centers in Costa Rica. As of July, at least 791 men were still being held in an Australian facility on the island of Manus. This week, Turnbull’s government agreed to pay roughly $52.75 million to more than 1,900 detainees who had alleged that they suffered physical and psychological injuries during their time at that facility.